“The Big Story.. the story of a reporter who has solved a crime, exposed a corrupt political administration, smashed a racket, or performed some other notable public service.” This rare collectors set includes 8 episodes of The Big Story and 3 episodes of Big Town starring Steve Martin. These were all transferred from 16 mm film. The Big Story was based on real life stories and featured murder and other violent crime cases from the point of view of a newspaper reporter. A unique and exciting format, The Big Story dramatized a different news reporter and their heroic deed. The Big Story TV show was based on the radio program of the same title which began in 1947. The television version ran on NBC from 1949 to 1957, then in syndication from 1957- 58. The syndicated shows were hosted by Burgess Meredith. 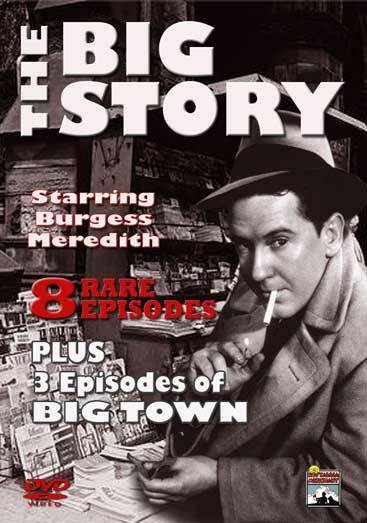 “The Big Story.. the story of a reporter who has solved a crime, exposed a corrupt political administration, smashed a racket, or performed some other notable public service.” This rare collectors set includes 8 episodes of The Big Story and 3 episodes of Big Town starring Steve Martin. These were all transferred from 16 mm film. In the Line of Duty, Until Proven Guilty, The Hackie Shakedown, The Theory of Murder, Suicide Pact, Silent Barrier, Fifteen Hours of Danger, Hit and Run, BIG TOWN: School Teacher, Semper-Fi, Boys Week.